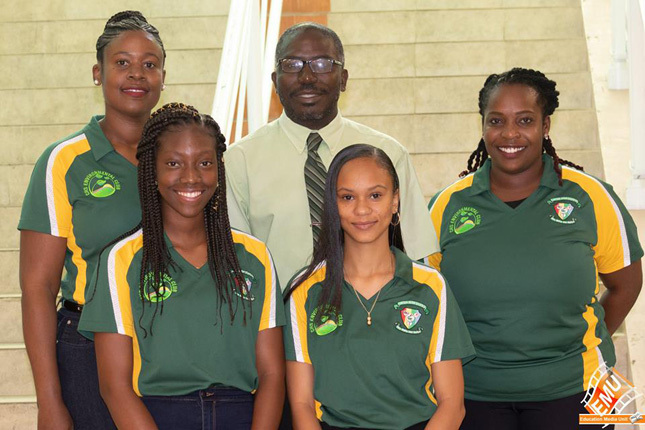 CHSEC: (L-R) Dallaries Spaire Daniel - Club's Accountant, Ludelcia Harvey - Student, Bionca Berry President and Dr. JoYelle Clarke Coordinator with Principal - Mr. Francil Morris. (EMU) – St. Kitts, April 2, 2019: A delegation from the Cayon High School Environmental Club departed the Federation on Monday 1st April to participate in the Association of American Geographers Annual Conference in Washington DC. The four (4) member team comprised two students, Bionca Berry (President) and Ludelcia Harvey accompanied by two teachers, Dr Joyelle Clarke – Environmental Club Coordinator) and Mrs. Dallaries Spair-Daniel – Accountant, will participate in sessions from April 3rd – 7th. She included that while the delegation is in Washington, they will meet with the consultant for the Man on the Biosphere Project in St. Kitts, Kathleen Pessolano. The team is set to attend a full week of conference sessions at the Association of American Geographers Conference, including career fairs for Geography Students, fieldtrips, tours, and panel discussions. The annual conference which is a professional and scholarly gathering of over 9,000 attendees will feature over 6,000 presentations in over 1,700 sessions throughout the meeting. One highly anticipated event for the conference this year, is a keynote session by Eric Holder who served as the 82nd Attorney General of the United States under President Barack Obama. This venture was made possible in partnership with the St Mary’s Man and the Biosphere Project, the GEF Small Grants Program and the Ministry of Education. Additional funding was done through club fundraising activities, sponsorship from the supportive parents and the community.